I am endeavoring to hike every trail in the McDowell Sonoran Preserve. Please consider sponsoring my journey at ProtectOurPreserve.org/donate. We only need another $3500 to meet our goal of $25,000 by the end of July! Last night when I was setting my alarm for 3:30 a.m. to do yoga and prepare for my 4:30 hike, my body said, “Rest.” I listened. 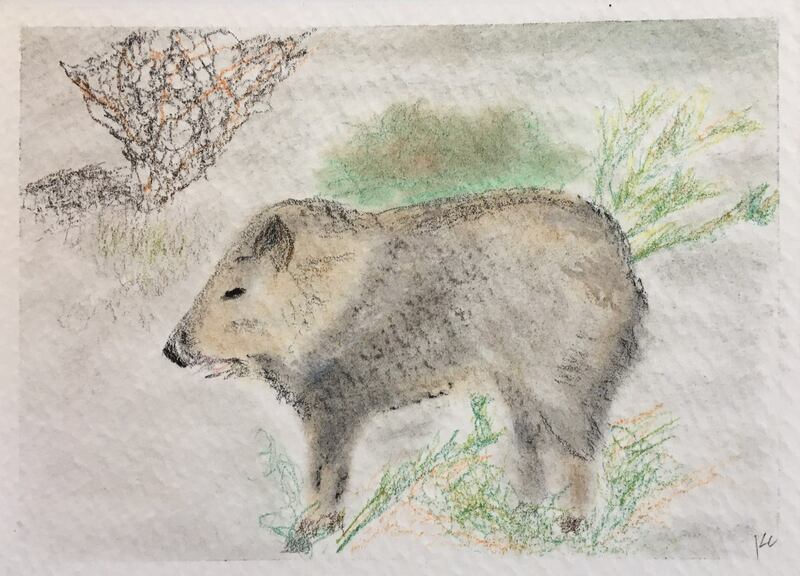 This morning, I “slept in” until 6, drank coffee with my husband before he left for work, and spent a few minutes contemplating the Preserve in the attached chalk pastel drawing of one of the javelinas I saw on Day 1. Available in post-card form as a thank-you to anyone willing to sponsor Rest. To be honest, it was/is hard to take a day off. I miss the Preserve today and have been toying with the idea of taking a hike just before sunset; however, if I am serious about completing this mission, I know I have to care for my body. Thanks to those of you who are following me. If you would like to hike a leg with me, or if you have ideas of how ProtectOurPreserve.org can get more people involved, please send me a message!